1. Preheat the oven to 200˚C, gas mark 6. Toss the butter beans with 1 tbsp oil, season, spread over a baking tray and roast for 20 minutes, turning halfway. Meanwhile, bring a pan of water to the boil and simmer the broccoli for 2 minutes, then add the sugar snaps and simmer for 1 minute more. Drain, refresh in cold water, then drain again and set aside on kitchen paper. 2. Return the dry pan to a medium heat and add the remaining 2 tbsp oil with the shallot, capers and sultanas. Fry, stirring regularly, for 8-10 minutes, until just golden. Add the sherry vinegar and take off the heat. 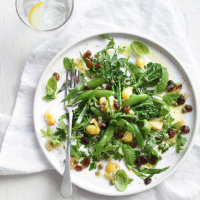 Toss the herbs, broccoli, sugar snaps and beans in a large bowl with ½ the dressing. Arrange on a serving platter and drizzle with the remaining dressing before serving.